Thank you to “Chungii V” of the UBC Botanical Garden Forums for submitting today’s photographs via the Botany Photo of the Day Submissions Forum. Much appreciated! Common fan-flower, or fairy fan-flower, is native to Australia. Different references suggest different distributions: the Flora of Australia only lists New South Wales and Victoria, while other references suggest South Australia and Western Australia as well. Not surprisingly, the number of species in different references ranges from 90 to 130 as well, so there is apparently some taxonomic confusion. This may help explain the uncertain distribution. Australia National Botanical Garden’s Growing Native Plants has a detailed entry on growing Scaevola aemula, though I note another discrepancy: Scaevola is defined here as “left-handed” (referring to the “one-sided feature of the fan shaped corolla”), whereas the Flora of Australia entry for Scaevola defines it as “little-handed”, suggesting that the “(dried) flowers are supposed to resemble a withered hand”. Scaevi- does mean left-handed, though, so it seems to me that the Flora of Australia is off on this particular term. What a cheering photo! And an interesting explication. Wow, they only have petals half way around! Hmmmm. Gaius Mucius Scaevola: legendary Roman hero was given the last name Scaevola after his attempt to kill the king wasn’t successful. To show he would endure any pain he put his right hand in the fire. He was given the surname name Scaevola “left hand” afterwards. 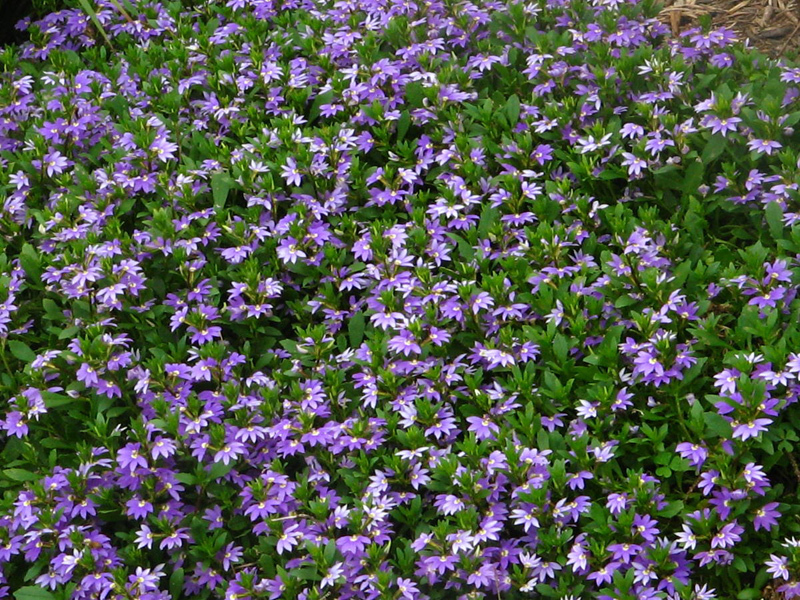 At least that was the story we heard in Australia as to why it looked like a hand and was named scaevola. Western Australia had numerous species that we saw and they shared this petal arrangement. I have planted this around the base of my cooling unit beside the house (Central Victoria, Australia). It is in bright but not direct sunlight and clayey soil which stays moist all year. It is doing so well that I have to give it a haircut two or three times a year! In contrast the one on top of a clayey mound in dappled light where it receives very little water hasn’t done much at all. Here in autumn it is in full bloom after a summer lull and the bees adore it. The beach Scaevola in Hawai’i were fascinating and this purple lovely is a very common landscaping plant in the Bay Area. yes, in central coastal california it is very drought tolerant, deer proof, long-flowering, and an under-used specimen. Hooray! so beautiful! I love that color. These are just exquisite little beauties! I wonder what the botanical/pollination advantage would be to having this shape & arrangement of petals, as opposed to a ‘full circle’ of petals? In one of my botany classes we studied these under dissecting microscopes. The yellow spot is actually the site of the pollen and is a fuzzy structure at the opening of a tube. It is one of the coolest flowers to look at under a scope! Following a disastrous bushfire that destroyed mine and 37 other homes in Toodyay, Western Australia on 29 December 2009, this very plant came up everywhere on my block and down to my neighbours – I dont recall seeing it much before then. 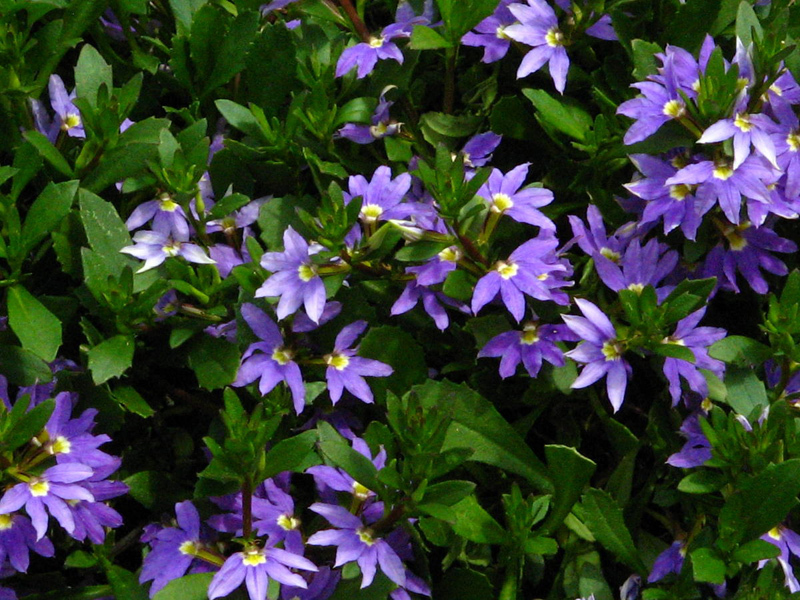 I have finally found time to search the web after rebuilding my home and have identified it as Scaevola aemula. I thought it may be a toxic weed that had gone mad, but am now very happy to allow it to grow throughout my bush block and hopefully come back each year. It has a fabulous perfume and pretty fan like purple flowers. Sorry to hear about the loss of your home. Thank you for the story, though.